I fell in love with it: beautiful, heavy, black, timeless. I had to buy my terrine mould as soon as I set eyes on it. Even the huge price tag did not deter me. I know it is French. Terrine is French. There is no way around it. But France is right next to Italy and in fact, part of what is now France was once Italy. The French Riviera town of Nice was once called Nizza and Giuseppe Garibaldi was born there. Garibaldi is partly responsible for the unification of Italy (though his home town became French as a result). So I did have Italy on my mind when I bought this mould. Wrapping a terrine in prosciutto even makes it a bit Italian! The word terrine is used to mean both the mould and the actual food. It is a rustic dish that was around in Roman times (maybe Julius Caesar tasted it when he spent all those years in Gaul – conquering, plundering, looting, enslaving…and eating terrine) and it is traditionally made mainly of pork. It may also be made with chicken, seafood or vegetables. It is a pretty clever way of assembling and compacting ingredients that may then be eaten cold or at room temperature. It lasts for days and looks beautiful when it is sliced. It is one of those dishes that looks terribly difficult but it isn’t. My favourite terrine is made with chicken and pork. Although it takes a bit of time to assemble, the result is well worth it. 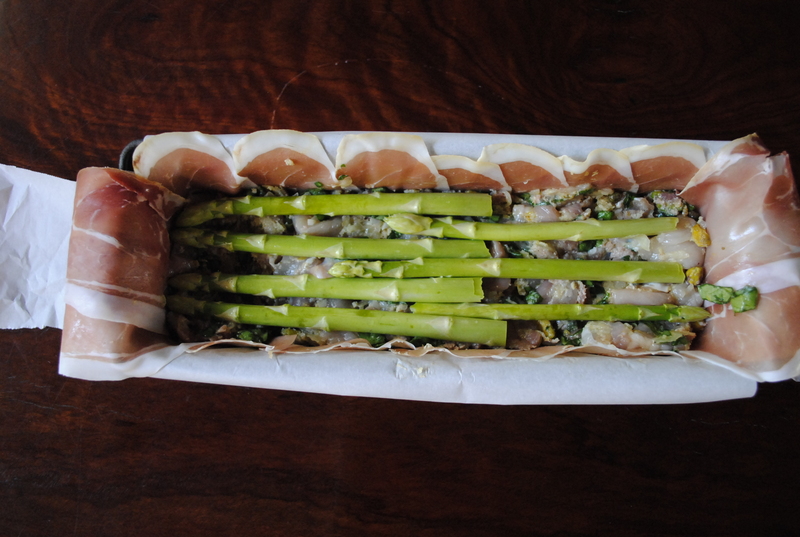 It contains pistachios, asparagus, spinach and is wrapped in prosciutto. The first time I made it I put in garlic that I had grown on my terrace, which made it pretty special. The colours and textures in it make it a feast for the eyes as well as the palate. It you don’t have a terrine mould, you can always use a cake loaf pan of similar dimensions to mine (30 x 10 x 7cm). You will need to make this a day before you need it. You can serve it with a mustard or relish – I made a red capsicum relish to go with it, which complements the flavour of the terrine as well as the colour. Melt the butter in a frypan and add the garlic and shallots. Cook until starting to soften then add the chicken livers and the brandy. Cook for a few minutes until the liquid evaporates a bit and place in a large bowl. Add the chicken, pork, nuts, spinach, bread crumbs, lemon zest, peppercorns, sage, egg, salt and pepper to the bowl. I like to soak the bread in a bit of milk to make the terrine really moist. Stir well with a large wooden spoon or with your hands. Line the terrine mould with baking paper so that enough hangs over the edges to wrap the terrine (an excess is good), then line with the slices of prosciutto. They should be overlapping slightly and hanging over the edge of the mould. Place half the mixture in the terrine mould and pat down with the back of a spoon to flatten. Arrange the asparagus spears so that they are side by side. Place the rest of the mixture on top and smooth with the back of a spoon. Wrap the overhanging prosciutto slices over the terrine filling so that it is encased by prosciutto. Wrap the overhanging baking paper around the prosciutto. You will need to cook this in the oven and in a bain marie (bagno maria in Italian or in a water bath in English). This means that the terrine mould sits in a tray that has water in it. You should put the tray half filled with water in the oven before you turn it on, so that the water is hot by the time you put the terrine in to cook. Make sure you don’t put too much water in so that it overflows when you put the terrine mould in it! The water should come half way up the sides of the terrine mould. It takes an hour to cook. You will know it is ready when it feels firm when you press in the centre with your finger. Allow the terrine to cool in the mould. Without removing the baking paper, place a weight along the length the terrine to compress it evenly (I used the heavy lid of my terrine mould but anything heavy like a few tins of tomatoes will do as long as the pressure is even along the length of the terrine). Place in the refrigerator overnight. To unmould, lift the terrine by the baking paper which you will have unwrapped from the top – you might need someone to help you – and slice with a sharp knife. Slices should be 1 – 2 cm thick, depending on how you like them. The capsicum relish has 2 large red capsicum sliced very thinly, 2 tablespoons of olive oil, 2 tablespoons of red wine vinegar (I used one that has raspberry through it), 2 tablespoons of caster sugar, a pinch of dried chilli flakes and 1/2 teaspoon of cinnamon. This is cooked altogether for at least 20 minutes in a small frypan. It is sweet and slightly sour and is perfect for the terrine (this easy relish is also nice with grilled or roast chicken). The beautiful photo of the terrine sliced ready to serve on a platter was taken by my niece who has a fabulous blog called Melbourne Gastronome. Just gorgeous! I love the pistachios studded through the terrine. Thank you! Some of the little green circles are asparagus as well as pistachio. Where did you buy your terrine dish? I’m looking for one at the moment. I’ve just started making my own pâté and would love to master terrines too. I bought it in a shop called Essential Ingredients. Any good kitchenware shop will have one. You can use a cake run of course and it is much cheaper but not nearly as beautiful.